Welcome to the Parish of Radlett. Thank you for visiting our website. Our hearts and prayers go out to the people of Sri Lanka following the atrocities there. The organisation Open Doors have published some helpful prayers which you may find useful. As members of God's family in Radlett we seek to worship and grow together as we learn to worship and serve God and our community through Jesus Christ. We aim to be a warm, caring and supportive fellowship where all are encouraged to grow in faith, worship and service. Our goal is to live God's love through Christian presence and engagement in the community. We are a Christ-centred church seeking to serve others by proclaiming the gospel, being accessible and offering a welcome to all in Christ’s name. We work creatively together as people of God to realise our ambition. 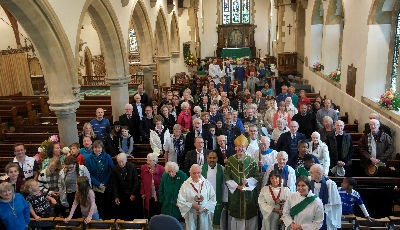 We are part of the Aldenham, Radlett and Shenley Team Ministry, part of St Albans Deanery and Archdeaconry, and are situated at the southern reaches of the Diocese of St Albans. We are delighted that you have visited our website and hope that you will soon join us in person for worship and other activities. Diverse styles of worship are offered at different times on Sundays and Wednesdays at Christ Church and St John’s. We hope you will find one of our services to suit your tradition and style. See the schedule on the Service Times page for details. Daily morning prayers are said communally for those who like the discipline of regular prayers. If you would like more information about what is going on in the parish, please contact us for details, follow us on Twitter @CCSJRadlett or Facebook Christ Church and St John's Radlett. The latest pew leaflet and quarterly brochure can be found in the News section. All our policies, including Safeguarding arrangements, can be found on our Policies page.